Southern Utah Museum of Art (SUMA) hosts A Legacy of Love: The Thread That Binds Us, an exhibition featuring the fashion designs of Eletra Casadei and her impact on the theatrical design and costumes of SUU Department of Theatre Arts & Dance. The exhibition is currently on display through November 11, 2017. SUMA is free and open to the public from Tuesday through Saturday from noon to 6 p.m.
L.A. fashion designer Eletra Casadei was an innovative and favored designer generating buzz with her TD4 (To Die For) prom dress designs created with teenage girls’ desires in mind, “prom parties” to kick off the fashion season, first-of-its-kind fashion videos showcasing her elegant gowns and original beaded and lace fabric designs. Her Casadei line embodied Eletra’s true fashion philosophy; to create a sense of Hollywood Glamour that was affordable and made every woman feel beautiful. Eletra passed away from brain cancer in 2008 leaving behind her fashion label and a studio stocked full of exquisite items. Eletra’s sister, Andrea, took charge of these treasures, searching for the perfect place to continue Eletra’s legacy. One thing led to another and soon one show turned into many. Through Andrea’s enthusiastic giving, the SUU Department of Theatre Arts & Dance received from Eletra’s studio yards and yards of stunning fabric and trim, bins of Eletra’s originally designed beaded fabrics and appliques, industrial sewing machines and equipment, a vast collection of fashion history books, and boxes of sewing notions. 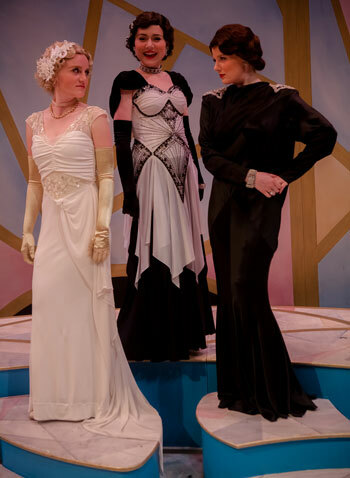 Over the last five years, students have been able to design and construct costumes beyond what would have been possible on a typical university production budget. Eletra was not only an exquisite designer, but a consummate educator, always taking young designers under her wing to mentor or finding time to teach at Otis Art Institute of Parsons School of Design. It is, therefore, most fitting that her legacy be continued at an institution of higher learning. A Runway Fashion Show and Luncheon will be held on Saturday, November 4, 2017 at noon. Tickets are available for $25 and a portion of the sales will go toward the Eletra Casadei Legacy Scholarship. For more information about A Legacy of Love: The Thread That Binds Us, please visit www.suu.edu/suma.